first order of business: locopops. if you’re ever in the triangle area, (they’re in raleigh, durham & chapel hill) get yourself there. based on the paleta, a mexican frozen treat, these cream & fruit based pops are sourced locally for their unique regular & guest star flavors and are just plain tasty. so imagine my excitement when locopops published their popular mango chile recipe in details magazine! 1. peel the mangoes, cut the flesh from the pits, and purée with the remaining ingredients. 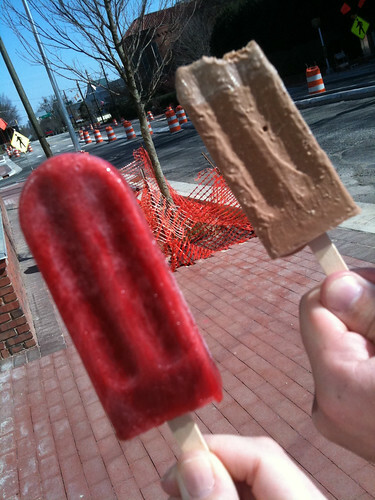 2. pour the puréed liquid into ice-pop molds and freeze for 8 hours. you see, when i get excited about making a locopops recipe at home, i’m not gonna wait 8 hours for them to freeze, because by then, i could have already gone to locopops. 16 times. it freezes popsicles in, oh, around 10 minutes & is just the coolest new summer toy around. This entry was posted in desserts, restaurants & places we ♥, snacks, things we ♥ and tagged chiles, fruit, mango, we've sold our souls to williams sonoma. Bookmark the permalink. I LOVE locopops…mexican chocolate is the must have then I always get one of the guest stars in addition….Lewis, my dog, really likes the pup-pops too…did you ever try their lavender cream pop…it was kinda crazy and kinda good. I LOVE the Mango chile, and so do my youngins. I had no idea they published the recipe! Thanks!